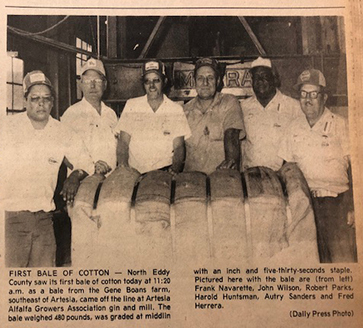 Looking back 40, 30 and 20 years ago, the following are excerpts from the Artesia Daily Press from Sept. 17-23. For the first time since a 1947 city law authorized parking meters, Artesia was without the armless bandits on Sept. 21, as a new parking ordinance went into effect. The 1947 law made it illegal to hitch animals to the meter posts or to use slugs instead of United States coins. Interestingly enough, the price of parking in Artesia never changed in 31 years, costing a nickel an hour and 10 cents for two hours. The 1947 ordinance was adopted by the city council and signed into law by Mayor A.P. “Doc” Mahone. A 6.0, 162-pound running back for the Artesia Bulldogs, Kevin Jones figures highly in the plans of the bulldog coaching staff as the offense has been revamped for Friday’s game with Cobre. Changes were made this week in an effort to develop a more consistent offense, a problem which has bothered Artesia in its first two games of the season. As reported in the Pinon News: Mr. and Mrs. Dave Benton from Lubbock, Texas spent the weekend at the Demery Anderson home. Sunday afternoon, they decided they would like to see Timberon, so they drove over that way and got in the rain storm and became stuck until they could not get out. Some hunters with a four-wheel drive found them and brought Benton back to the Anderson home. David Anderson went back with Benton and tried to get their car out but failed, to they again returned to the Anderson home, this time with Mrs. Benton. Mrs. Anderson reported they all got to bed about 3 a.m. After it dried awhile Monday, they went back and got Benton’s car out of the mud. Dan Salzwedel, Lake Arthur superintendent of schools, has finished the first draft of a coaching manual he wrote for young basketball coaches who are just getting their feet wet in the sport. Salzwedel has several years of coaching experience behind him, and that experience is reflected in the 210-page book. Fred Cole is, at 80 years of age, known as “Mr. Bulldog” around town because of his long involvement with Artesia football, and his 15-5 record was good enough to notch him the $10 first prize in last week’s football contest. Two other persons — rick Balencia and Richard Orosco — also were 15-5, but Cole was the closest on the tire-breaker. He was presented with his $10 check by James Green, publisher of the Artesia Daily Press. As reported in the Pinon News: Mike Anderson is helping Vernon and James Fleming cut wood on the old Tom Green homestead on the Pinon Ranch. Mike is staying at his parents’ home near Mr. and Mrs. Demry Anderson. The Flemings are to clear the timber off the Green place so the Pinon Ranch can run cattle there. The brush has been so thick it is nearly impossible to work cattle there. “Midnight Run” and “Cocktail” were the featured films of the week at Cinema Twin. When it had begun to seem that never had so many waited so eagerly for a signature, President Reagan late Thursday (Sept. 23) signed the appropriations bill funding creation of the Federal Law Enforcement Training Center in Artesia. The President signed the bill with it’s $7 million allocation for purchase and renovation of the former Artesia Christian College campus, while returning to Washington aboard the presidential jet Air Force One after a day campaigning in Texas. Friday’s night’s Battle of Champions was everything that would be expected of a match-up between the two greatest teams in the state. The Artesia Bulldogs (now 4-0), defending AAA State Champions, traveled to Roswell to meet defending AAAA State Champions, the Goddard Rockets (now 3-1), to hand them their first loss of the season. Despite great effort on the parts of both teams, only the best would come out on top, and they did. The winning point came off Clinton Greathouse’s foot as he kicked the PAT to put Artesia on top, 13-12. “Our ability to kick that last PAT and two field goals wound up being a huge factor in the game,” says Bulldog football coach Cooper Henderson. As reported in the Pinon News: Mrs. Robert Bell reported there were 75 family members to attend the family reunion at their ranch more than a week ago. Dorman Bell, son of Mr. and Mrs. Craig Bell, who left here when he was a small boy, came t the reunion for a short visit from California. Also Mrs. Bell reported there was one family that had not attended any reunion before, a woman, her daughter and her daughters from Long View, Texas.